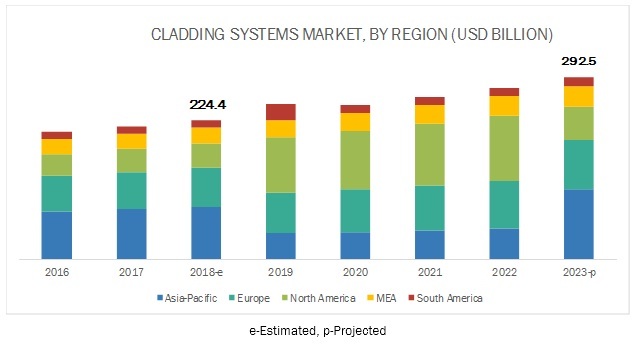 [163 Pages Report] The cladding systems market is projected to grow from USD 224.4 billion in 2018 to USD 292.5 billion by 2023, at a CAGR of 5.44% from 2018 to 2023. Demand for cladding systems market can be credited to the high growth of construction industry across the globe. Factors such as increasing residential and non-residential construction and infrastructure activities, its high durability, and ability to enhance the aesthetic appearance of the buildings drives the demand for cladding systems. In terms of volume, the ceramic segment is projected to lead the cladding systems market from 2018 to 2023. Based on materials, ceramic cladding systems dominated the market. Ceramic is mainly used for tile cladding, hence play an important role in the construction industry. The ceramic tiles enhance the overall atmosphere of a residential or commercial landscape. The selection of the type of these tiles is based on several factors such as ease of maintenance, durability, comfort, safety, style, and design templates. With the emergence of new technologies, such as EIFS, manufacturers are looking for advanced techniques to make cladding systems more effective. In terms of value and volume, the walls segment of the cladding systems market is projected to grow at the highest CAGR during the forecast period. The wall segment is projected to account for the largest share in the cladding systems market during the forecast period, on the basis of use. This is due to the larger surface area held by walls in a building. Materials such as wood and fiber cement are gaining high traction in the wall cladding systems, majorly in residential buildings. Growing construction industry and government regulations regarding zero energy building codes some of the major drivers supporting the growth of cladding systems market, which further provide a huge opportunity for market players to develop more effective cladding systems. In terms of value and volume, the Asia Pacific region is estimated to account for the highest share in the global cladding systems market during the forecast period. The Asia Pacific region, which is witnessing a rebound in its residential and non-residential construction sector, held the largest market share in 2017. 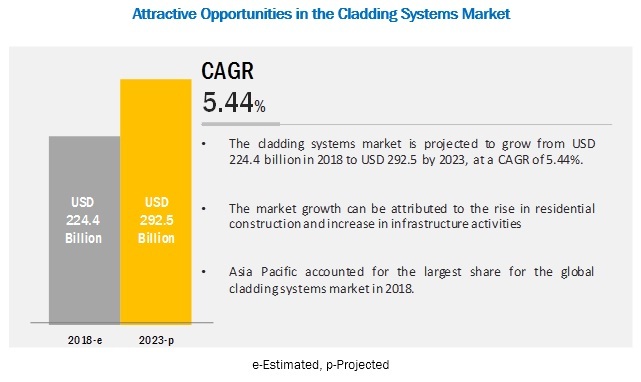 Also, the market for cladding systems in this region is projected to grow at the highest CAGR from 2018 to 2023, in terms of volume. The Asia Pacific region is projected to lead the cladding systems market from 2018 to 2023 due to the strong demand from countries such as the China and India. The demand is also driven by the increasing availability of raw materials and manpower, along with sophisticated technologies and innovations in this region. Key players such as Compagnie de Saint-Gobain S.A. (France), DowDuPont (US), Tata Steel Limited (India), Arconic (US), Westlake Chemical (US), Etex Group (Belgium), James Hardie Industries PLC (Ireland) adopted these strategies to strengthen their product portfolios, expand their market presence, and enhance their growth prospects in the cladding systems market. Compagnie de Saint-Gobain S.A. is one of the key players in the cladding systems market. Its strong business portfolio along with the wide geographical presence, contributes toward its leading share in the cladding systems market. High revenue and adoption of strategic initiatives such as partnership, joint venture, contract, acquisition, and expansion have ensured its leading position in the market. In 2016, Saint-Gobain (France) acquired E-mix (Singapore), an Asian dry mixes, and mortars company. Through this strategic initiative, the company aims to increase its opportunities, and scope in emerging countries. In April 2018, James Hardie Industries Plc. (Ireland) acquired a European building material business- Fermacell GmbH (Germany), with an aim to strengthen its business. This strategic initiative is expected to spur the growth of its fiber cement business across Europe. Furthermore, it will also strengthen its geographical footprint, and product portfolio. In May 2018, Tata Steel Limited’s wholly-owned subsidiary Bamnipal Steel Limited (BNPL) (India) acquired Bhushan Steel Limited (BSL) (India). This acquisition is expected to increase the steel capacity of the Tata Steel Group as a whole. In October 2017, Kingspan (UK) acquired Isoeste Construtivos Isotérmicos S.A. (Isoeste) with an aim to expand its business in South America. Isoeste is a manufacturer of insulated panels. Kingspan has acquired 51% shares in Isoeste. What are the global trends in the cladding systems market? Would the market witness an increase or decline in the demand in the coming years? What is the estimated demand for different types of cladding systems products? Where will the strategic developments take the industry in the mid to long-term? What are the upcoming industry applications and trends for cladding systems? Who are the major players in the cladding systems market globally? 9.5.1.1 Turkey to Lead the Cladding Systems Market in the Middle East & Africa, in Terms of Value. 9.5.2.1 Saudi Arabia to Be the Second-Fastest Growing Market in the Middle East & Africa, in Terms of Value. 11.1 Compagnie De Saint-Gobain S.A.
* Business Overview, Products Offered, Recent Developments, SWOT Analysis, and MnM View Might Not Be Captured in Case of Unlisted Companies. The study involved four major activities for estimating the current global size of the cladding systems market. The exhaustive secondary research was carried out to collect information on the market, the peer market, and the parent market. The next step was to validate these findings, assumptions, and sizes with the industry experts across the value chain of cladding systems through primary research. Both, top-down and bottom-up approaches were employed to estimate the overall size of the cladding systems market. Thereafter, market breakdown and data triangulation procedures were used to estimate the size of different segments and subsegments of the market. In the secondary research process, various secondary sources such as Hoovers, Bloomberg BusinessWeek, and Dun & Bradstreet were referred to, so as to identify and collect information for this study on the cladding systems market. These secondary sources included annual reports, press releases & investor presentations of companies, white papers, certified publications, articles by recognized authors, gold & silver standard websites, food safety organizations, regulatory bodies, trade directories, and databases. The key players were identified through extensive secondary research. The industry’s supply chain and market size, in terms of value, were determined through primary and secondary research processes. After arriving at the overall market size from the estimation process explained above, the total market was split into several segments and subsegments. 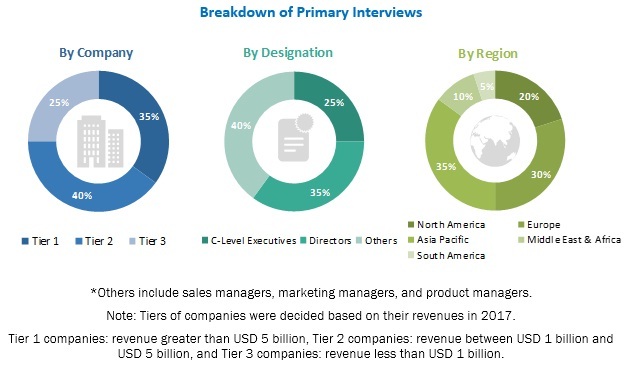 The data triangulation and market breakdown procedures were employed, wherever applicable to complete the overall market engineering process and arrive at the exact statistics for all segments and subsegments of the cladding systems market. The data was triangulated by studying various factors and trends from both, the demand- and supply-side. This research report categorizes the cladding systems market based on material, use, application, and region.